يبدو أنك لا تقرأ أي شيء من المكتوب ..
هيرودوت لم يصمم اي خرائِط في كتاب التاريخ يابن المسيح ..!! يوم القيامة قريب .. لن ينفعك فيه إلا عملك .. ابحث بنفسك لنفسك .. ولتكن هذه هي بداية البحث الحقيقي : "لماذا كذب هؤلاء" .. واسأل نفسك "لماذا نقلت (أنت)عنهم الكذبة بدون تحقق"
كان أناكسيماندر, بطليموس, هيرودوت, هكاتيوس, إراتوستينس, بطليموس من اوئل اليونانينن الذين قاموا برسم الخرائط بالاستعانة بالرياضيات إضافة إلى الملاحظات المدونة من المستكشفين انذاك. ويعتقد ان اناكسماندر كان أقدم يوناني رسم خريطة (تقريبا 611–546 ق.م) للعالم وكان مؤمنا بان شكلها يشبه الاسطوانة المعلقة في الفضاء وان عالمه يكون أعلى هذه الاسطوانة. بعد 50 عام تبعه هيكاتيوس من ميليتوس برسم خريطة أخرى شبهت عالمه بالقرص الدائري التي تكون اليونان مركزه من حولها المحيط. كما أن البحار سيلاكس كان أول من اضاف تعليمات الابحار على الخرائط التي رسمها لتصبح معلما أساسيا فيما بعد لمنتجي الخرائط. يعود الفضل الأكبر لبطليموس الذي اقترح ان الأرض يمكن تخيل شكلها الحقيقي اذا ما استعملت الحسابات الرياضية وعلم الفلك وتوصل إلى الفرضية الكروية للارض كما اقترح ضرورة تحديد مركزها وعمل نظام احداثيات وهذا ما ال اليه العلم الحديث في تصوير الأرض واستخدام احداثيات الطول والعرض. كما أن ايراتوسينس اليوناني المصري كان أول من توصل إلى رسم وحساب تقريبي لمحيط الكرة الأرضية في تجاربه التي اجراها بالاسكندرية وتوصل إلى قيمة تقرييه بين 40000 إلى 460000 كم. طيب بالهداوة يا ابن المسيح .. سأعتبرك لا تقصد ولا تتعمد التجاهل لما يُكْتَب ..
1- الخريطة الموجودة في صفحة 740 ليست الخريطة التي رسمها هيرودوتس , ولكنها خريطة قام برسمها المؤرخون بناءاً على كتابات هيرودوتس لتقريب الصورة لأذهان القراء , عن ما يظنه ويعتقده هيرودوتس . إذا وصلنا إلى هذه النقطة وتأكدنا منها أبلغني . أجاب الفاضل ابن المسيح اجابات متعددة ..
أولها : دوروا انتم في كتبه.!! ثانيها : ثم تراجع عن الاسلوب السابق وحاول الإستدلال فكان استدلاله : أنه ذكر "جبال العرب" , "العربية" ..! ثالثها : أنه حاول محاولة ثالثة فقال أنه - اي هيرودوتس - رسم خريطة بيديه وليس فيها مكة ..
هل زار هيردوتوس شبه الجزيرة العربية وغرب الجزيرة العربية؟!!! .. الدليل ..!! هل كان بطليموس بن لاجوس جغرافياً ؟!! ومن هو هذا الجغرافي الثاني "ارسطوبولس" الذي ارسله الإسكندر في القرن الخامس قبل الميلاد .؟! 1-هل زار هيردوتوس شبه الجزيرة العربية وغرب الجزيرة العربية؟!!! .. الدليل ..!! 2- هل كان بطليموس بن لاجوس جغرافياً ؟!! 3- وهل ذهَب إلى جزيرة العرب أصلاً ؟!!. 4- ومن هو هذا الجغرافي الثاني "ارسطوبولس" الذي ارسله الإسكندر في القرن الخامس قبل الميلاد .؟! فنطالب المدعي بتصحيح الإسم أولاً .. وإبلاغنا من في التاريخ اسمه "أرادوثنيس" ..!! حتى نقف عليه وعلى كتاباته وخرائِطه .!! وهل بالفعل رسم خريطة للحجاز او غرب الجزيرة ولم يذكر مكة .. أين هي خريطته تلك ؟.!!! خذ وقتك وراحتك لكن لا تطيل علينا الانتظار ..
Herodotus was a Greek wrote his geographic histories around 484-424 BC. Herodotus is called the "Father of History", who was also an ancient geographer who made a lot of major mistakes. However, he is one of the oldest known geographers. Herodotus clearly refers to cities and mountains in the Nile Delta west of the Red Sea and Gulf of Suez. Some use this a proof that Mount Sinai and be in the Modern Sinai Peninsula but this is a fiction. For these people fight against Mt. Sinai being where the Bible says it is, Saudi Arabia, they are content to put it ANYWHERE, including Egypt proper. We have supplied three maps based directly upon the writings of a Greek geographer and historian named Herodotus who lived in 450 BC. Like Hesiod and Hecataeus his predecessors, he possessed a shallow concept of Israel and has a vague understanding of the Red sea and wrongly viewed it at as a single finger of water. Apart from the Bible's clear references to Arabia as a geographic place in 1000 BC (2 Chronicles 9:14) Herodotus is the oldest secular historian who records the region of Arabia, some 550 years after the Bible. No ancient author ever called any freshwater lake a "Sea of Reeds". Those who say so are perpetuating a fiction to prop up wrong and failing exodus routes at or near the Bitter lakes. Although we do not have any actual maps of Herodotus, people have gone to great lengths to create maps based directly on his writings. Below are a few examples. Looking at these modern reconstructions, we immediately notice two glaring problems with his geography that modern cartographers accurately drew. First the Red sea is a single finger of water that does not split into the Gulf of Suez and the Gulf of Aqaba. Second, there is no reference to Israel except perhaps "Philistina" (Philistines), Judah or the Jewish nation anywhere in Herodotus' writings. The map reflects this and only notes Phoenicia. Herodotus being a pagan Roman living in modern Italy, must have deliberately ignored Israel for some unknown reason. Herodotus also discusses how God destroyed Sennacherib's army confirming the text of 2 Kings 19:35-36. Although he wrote his six books in 450 BC, the earliest actual manuscripts of Herodotus are dated 900 AD. That means there is a span of 1350 years between when the book was written and the earliest actual hard copies that are extant. There are 8 different manuscripts of Herodotus, the oldest being dated from 900 AD. We need to remember that the manuscripts of Herodotus' history likely contain changes as do other ancient works. For example, Agatharchides of Cnidus wrote, "On the Erythraean Sea" in 169 BC, has been reconstructed from three other ancient authors: Diodorus (49 BC), Strabo (15 AD), Photius (897 AD). The original script of Agatharchides, often has three widely varying readings or "fragments". This is instructive because Photius, who lived in 900 AD (the same time as the oldest manuscript of Herodotus) greatly changed and embellished with his own comments of Agatharchides words when compared to the older versions of Diodorus and Strabo. Of course none of the three agree and contain many differences. This contrasts with the Bible, where we have a complete copy from 325AD and over 50,000 manuscripts. The variation between all the manuscripts is very slight. What this means, is that later copyists may have inserted the post 135 AD name of "Palaistinê" into Herodotus' work. In any case, it is clear that Herodotus used "Palaistinê" to refer to everything from Syria to Egypt, including Israel. Other ancient geographers said that Arabia was directly next to Goshen in Egypt because after 106 AD Caesar annexed the modern Sinai Peninsula and renamed it "Arabia. Probably both the words "Arabia" and "Palaistinê" were glosses added to reflect post third century AD geography and terminology. He has zero concept of the Gulf of Aqaba. Herodotus had zero concept of the Gulf of Aqaba. This is one reason why he seems to place Arabia so near Egypt. He draws the entire Red Sea as a single finger without knowledge of the Sinai Peninsula or the Gulf of Aqaba. Had he known about the Gulf of Aqaba, he would have placed Arabia further away. Even so, Herodotus clearly places Arabia in the area of the Arabian Peninsula both south and to the east towards Assyria. Herodotus speculates that geologically, in some ancient time (20,000 years ago), there was a second Gulf that started on the Mediterranean and extended south towards Ethopia, then circled through the Nile Delta travelling northwest to almost touch the Gulf of Suez. This "ghost gulf" as we call it is known to be geologically false and he was totally wrong. Some people wrongly think the ghost gulf that almost touches the Gulf of Suez describes the Gulf of Suez touching the Gulf of Aqaba. "the two gulfs ran into the land so as almost to meet each other, and left between them only a very narrow tract of country" (2:11). One of these two Gulfs was the Gulf of Suez and the other was the Ghost gulf to the west and they came together and almost touched. 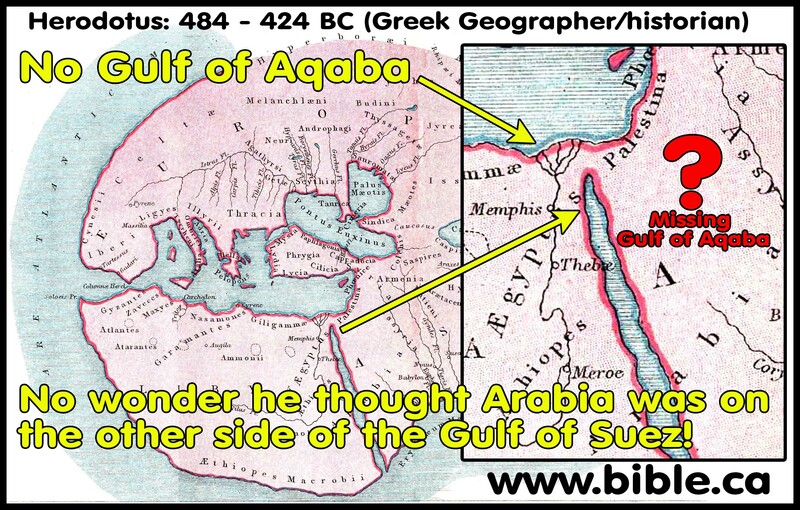 Herodotus had no idea the Gulf of Aqaba even existed and this is why he seems to say in some places that Arabia is east of the Gulf of Suez. He clearly places Arabia far to the south. The Canal often abandoned to silting and was successfully reopened to navigation by Sity I (1310 BC), Necho II (610 BC), Persian King Darius (522 BC), Polemy II (285 BC), Emperor Trajan (117 AD) and Amro Ibn Elass (640 AD), following the Islamic conquest. IV. Herodotus ignores Israel: "Syrians of Palestine"
Herodotus called the land of Israel "Palestine" (ie. Philistines) in 450 BC. Herodotus did write of "palaistine" in Greek, however, he was not referring to "palestine". The Philistines have an occupational presence in Canaan that dates back to the time of Abraham. "Palaistine" referred to the land of the Philistines. He wrote of "palaistine syrine"--the Philistines of Syria--which was a limited area near the southwestern coast of Israel. History shows that it was Hadrian who renamed the land of Israel "Palestine" [ie. the land of the Philistines] in 135 AD. Hadrian's intent was to wipe out all traces of the Jews. The fact he gave Jerusalem a new name, "Colonia Aelia Capitolina" and the land a new name "Palestine". This proves above all that the land of the Jews was not called Palestine in the first century in a formal sense, for if it was, Hadrian would never have used a name already associated with the Jews. The apostolic fathers reflect this change in their writings. Herodotus used the term Palaistinê to describe not just the geographical area where the Philistines lived, but the entire area between Phoenicia and Egypt, including the promised land of Israel. Herodotus actually tells us that he did not travel personally to either Egypt or Israel and relied upon second hand accounts of others. On the other hand, later copyists may have inserted the post 135 AD name of "Palaistinê" into Herodotus' work. In any case, it is clear that Herodotus used "Palaistinê" to refer to everything from Syria to Egypt, including Israel. Some type in the word "Arabia" on the internet to find places where Herodotus seems to locate Arabia immediately east of the Suez Canal/Gulf of Suez in the Sinai Peninsula to save their pet Mount Sinai location in the Sinai Peninsula. This kind of sloppy "word text-proofing" usually misses the context. Is Arabia now inside the Nile Delta? Of course not. So context is everything. But wait! Herodotus actually does view the area west of the Red Sea (Arabian Gulf) as being Arabia in some sense! So yes, context is everything. What proves too much proves nothing at all!!! Not a single reference below refers to any part of the Sinai Peninsula. Herodotus says Arabia (or Arabians, Arabian city) is in the Nile Delta and the mountain range 15 miles south and east of the Pyramids running down the WESTERN shore of the Gulf of Aqaba. For those twisting and contorting the words of Herodotus to make him say the Sinai Peninsula was in his mind ARABIA, they are in for a "truth shock". Herodotus' Mountains of Arabia are west of the Red Sea (Arabian Gulf). These mountains are not in Arabia they are in Egypt. They are call Arabian mountain because they flank the border with Arabia on the other side of the Red Sea. We all understand that Donald Trump's "Mexican Wall" is on US soil. Even if the Mexicans paid for it after all just like Trump promised! 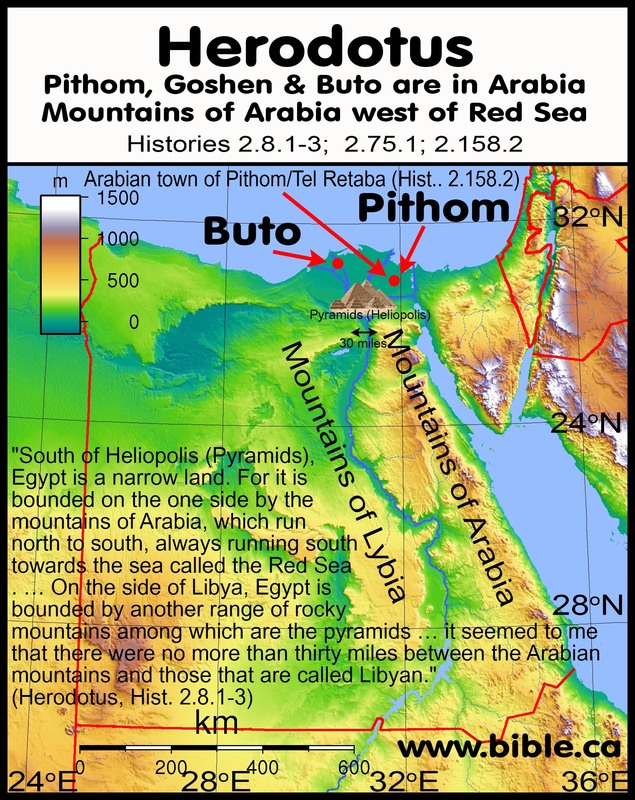 Herodotus calls Pithon in the Eastern Nile Delta beside Goshen, AN ARABIAN TOWN! When those bent on keeping Mt. Sinai out of Saudi Arabia quote ancient historians who say Hebrew Goshen in Egypt was in fact Arabia, you wonder why the Israelites ever left? 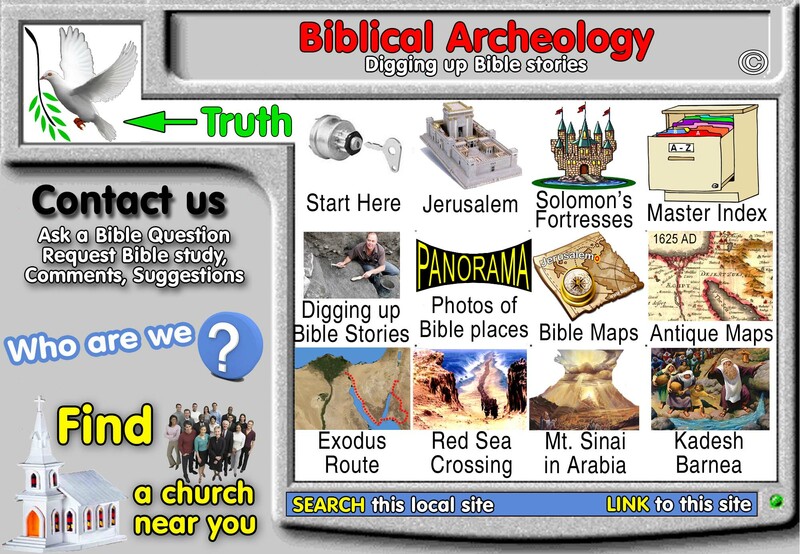 It simply trashes the Bible story like putting Kadesh Barnea inside the promised land at Qudeirat. Herodotus mistakenly said the Nile flooded Arabia? It is impossible for the Nile to flood across the Arabian Sea (Red Sea). Notice he makes this ridiculous statement about the Nile flooding Arabia because he had no first hand knowledge. But wait! Herodotus viewed the land west of the Red Sea (Arabian Gulf) as Arabia! The waters that flood Arabia are not flowing across the Suez Canal, but the east side of the Nile Delta near both Goshen and Pithom. Now Buto is the archeological site of Tell al-Fara'in near Rosetta in the north western Nile delta. Herodotus describes how ibis birds eat winged water snakes near Buto. It is interesting that the snakes fly from Buto in Arabia to Egypt. Strangely, either the site is wrong, or Herodotus simply got it wrong because he says that Buto was " where a narrow mountain pass opens into a great plain, which adjoins the plain of Egypt". For those wanting to make this Goshen, it doesn't fit any better than Tell al-Fara'in because neither have mountain passes. The Buto Herodotus is speaking of may be a different location altogether. Some place it near Tel El-Dab'a, which is easily explained as being near "Arabia-Town/China-Town". a. "Arabian cities" in the Nile Delta are merely Arab immigrants who formed a majority population in a city inside Egypt. There is a "China Town" in ever major city, but we all know where China is not. b. The references to the "Arabian Sea" and the "Arabian Mountains" does not mean Arabia inside Egypt, west of the Red Sea or even close by. These references simply mean the Egyptian mountain range flanged entire length the Arabian Sea which separated Egypt from the territory of Arabia proper. a. This is sloppy and inaccurate. b. In fact, Herodotus’ description of Arabia, if taken equally shallow and superficially, would also include all of the Nile Delta, the mountain range 15 miles to the east off the Great pyramids that flanks the west side of the Arabian Gulf (Red Sea including Gulf of Suez) AND the Sinai Peninsula in Arabia of his day." c. With all this keep in mind that Herodotus relied upon second hand reports and clearly had no idea of the Gulf of Aqaba. 3. 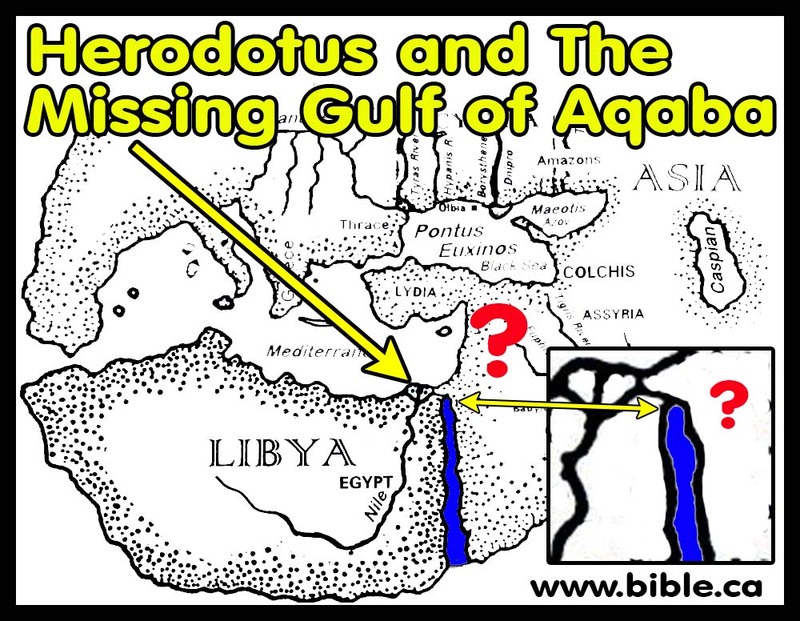 Herodotus ignored the REAL Gulf of Aqaba, while invented a PHANTOM Gulf of the Nile! a. Herodotus had no idea the Gulf of Aqaba existed and this explains why he seems to place Arabia so close to the Gulf of Suez. b. He admits he relied upon second hand reports of the geography of Egypt. c. This underscores that his understanding of the Red Sea, Gulf of Suez and Gulf of Aqaba were flawed. 8. If Herodotus had understood the Gulf of Aqaba, he would have known that the Sinai Peninsula was not part of Arabia. If your take a modern map and remove the Gulf of Aqaba (and therefore the modern Sinai Peninsula disappears), you too would think Arabia was beside the Suez canal like Herodotus. Herodotus was only partially correct on two different elements of his geography. He correctly understood that the Red sea was near the Nile, and that Arabia was east of the Red Sea. He was simply unaware of the missing the 250 km! 9. Those who use Herodotus to prove the Sinai Peninsula is Arabia in the mind of Herodotus are perpetuating an historical fiction. في عرف الحوارات والمناظرات لا يجوز الرد على السؤال بسؤال , إلا إن كان السؤال يحتاج توضيحاً , فيتم الإجابة على السؤال اولاً أو توضيحه وتحليله أو طلب توضيحه من السائِل ثم الإجابة وبعد ذلِك يحق لك أن تسأل ما تريد .. أي محاولة لعدم الجواب .. هو انقطاع عن هذه النقطة , مما يعني عدم صحتها وأنها كانت مجرد ادعاء. لقد فتح لك المشرف جميع الصفحات التي اعطيتنا أرقامها , فوجدناها جميعاً للاا تتكلم عن العربية , وأي كلام عن العربية فإنه في الحقيقة كان يصف حدود مصر فقال أن شرقها جبال العربية ,... لايوجد إطلاقا أي نص قال في أنه زار جزيرة العرب أو حتى غرب الجزيرة , بل ولم يتطرق إطلاقا لقبائل العرب أو اي شيء عنهم إلا اللهم (المر واللبان الذكر , والثعابين الطائر) وجميعهم حكاها له شخص عربي ..!! ارفق الدليل من اقوال هيرودوت , او اي عالم من علماء التاريخ بأنه زار العربية ..!! الويكيبيديا العربية ليست مصدر موثق للمعلومة , فكل يكتب ما يريد , وإذا فتحت الرابط الآن لن تجدما نقلته لنا من أن هيرودوت رسم خرائِط , لأن أي انسان يستطيع التغيير في هذا النص , فهو غير موثق . أعد فتح الرابط لن تجد فيه "هيرودوت" ..!!! مما يعني عدم مصداقية ما يُكتب فيها .!! من فضلك لا لتضييع الوقت .. واحترم عقليتنا باستخدام ادلة معتبرة .. وليس مجرد دعابات. اعطنا اسم عالم جغرافي واحد او مؤرخ قال ذلِك .!!! الكل يتابع ما تفعل .. اي محاولة لتكرار الكلام دون ارفاق ادلة , تعتبر نقاطك منتهية .. وحججك باطلة ..
لويكيبيديا العربية ليست مصدر موثق للمعلومة , فكل يكتب ما يريد , وإذا فتحت الرابط الآن لن تجدما نقلته لنا من أن هيرودوت رسم خرائِط , لأن أي انسان يستطيع التغيير في هذا النص , فهو غير موثق . لم يعد من الشطط القومي – والحالة هذه - أن نحدد ما يعرف بالعالم القديم في مصر والعراق على أنه " الوطن العربي " فعلا لا قولا"، على اعتبار أنه الموطن الأول للجنس العربي، ناهيك عن شمال أفريقيا التي وصلها الكنعانيون ( الفينيقيون ) في القرن الخامس عشر ق.م من الشاطئ السوري، واستمروا فيها حتى سقوط قرطاج في القرن الميلادي الثاني بيد الرومان. يقول شارل جوليان في كتابه " تاريخ أفريقيا الشمالية " أنه قبل الوصول العربي الفينيقي لم يكن هناك أي أثر لحضارة في شمال أفريقيا، وأن الفينيقيين هم أول حضارة معروفة هناك . هذا سوف يعطي لأسطورة القبيلتين البربريتين "صنهاجة" "وكتامة"، على أنهما بقايا غزو يمني مزعوم إلى تلك الأصقاع، ما يبررها. خاصة وأن اللغة البربرية ذاتها تنتمي إلى عائلة اللغات السامية المشرقية . غير أننا يمكن أن نحدد توثيقا أكثر مصداقية لهذا الإدعاء من خلال تقسيمات المؤرخين والجغرافيين اليونان، ابتداءً من هيرودوت في القرن الرابع ق.م، إلى ديودوروس الصقلي في القرن الميلادي الأول، الذين أطلقوا على هذا الجزء من العالم الممتد من مصر النيل إلى العراق فالجزيرة العربية جنوبا ( أرض العرب ) ، وقسموها إلى ثلاثة أقاليم رئيسية هي العربية الصحراوية والعربية الصخرية والعربية السعيدة .